Hatch Chile Express gives America’s favorite comfort food a New Mexican twist. Bring a large pot of water to a boil. Add pasta and cook according to package directions. Drain pasta and set aside. Meanwhile, in large skillet, fry the bacon over medium heat until crispy. Transfer bacon to a paper towel, blot off excess grease with a second paper towel. When cool enough to handle, crumble the bacon. In the same pan, sauté the onion until lightly golden and remove from the heat. In a large saucepan over low heat, combine butter and whipping cream until butter has melted. Add cheese cubes, stirring constantly. When cheese has melted, stir in flour and mix well. Add Hatch green chile and increase heat, bringing sauce to a boil. Remove from heat. 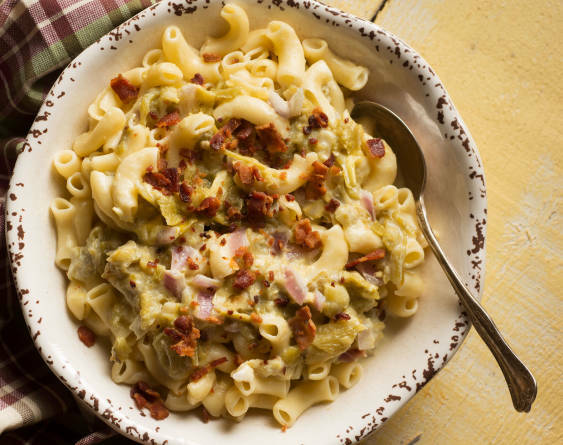 In a serving bowl, combine pasta, cheese sauce, onions, and half of the crumbled bacon, stirring until pasta is evenly coated. Serve immediately, garnished with remaining crumbled bacon.